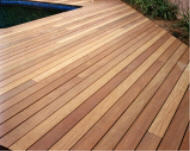 Decks of Ipe, Mangaris, Cumaru and other hardwoods. Various hardwoods, like Ipe, Mangaris, Cumaru and others have come on the market and have some definite advantages. They don't need to be sealed, but look great when they are. They are so dense that termites don't have a chance and most are fire resistant. They have no knots, so are a good value, being a bit more expensive than construction heart redwood, which has a good deal of knots and being less expensive than clear redwood, while being low maintenance and long-lasting. They sometimes cup (warp up), particularly on the ends requiring sanding after the first year. Ipe' has gone up in price, while Mangaris has stayed the same, so most recent projects have been done with Mangaris Diamond, which has a Class A fire rating. 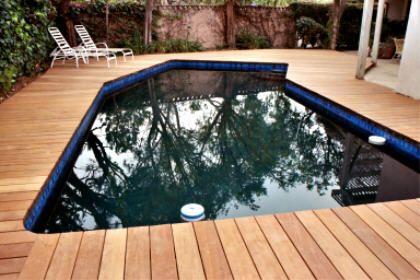 For more information, see our deck refinishing page. 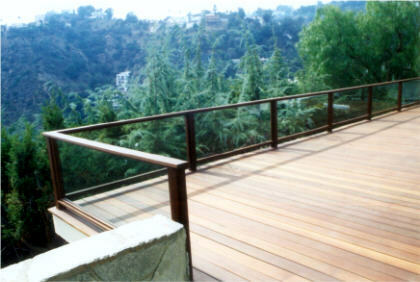 To see many more deck pictures, see our Decks page.